Independent shop Bill’s Auto Service could no longer compete in a changing world. 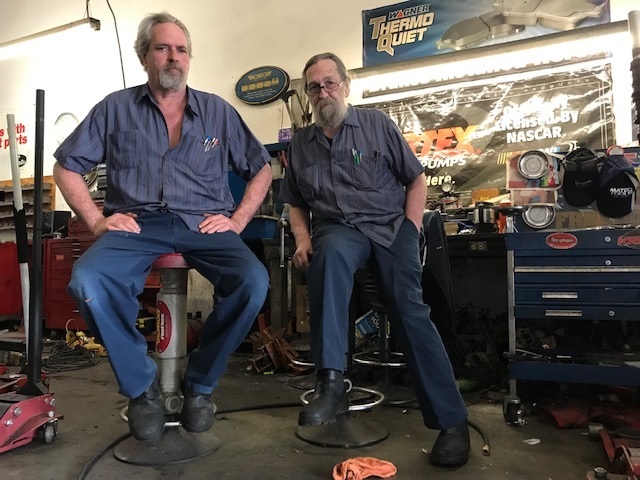 Two brothers have operated the shop that was founded by their father in 1963. I write about them for Friday’s column. Above, Brian and John Brew in their shop Tuesday. I gave up my Monday evening to make an unplanned visit to the Montclair City Council meeting — and am glad I did. Perhaps you will be too after you read Wednesday’s column. Column: Will Montclair lure an In-N-Out? Montclair says it’s close to getting an In-N-Out. In-N-Out says that’s not true. Well, I got a column out of it anyway (especially as it was almost finished when In-N-Out replied), working in a lot of In-N-Out stuff from Pomona and La Verne. That’s Sunday’s column. Replacing the ailing Paul Eaton as mayor of Montclair is Ginger Eaton, his wife, who was appointed Monday to serve out the final four months of his term. I was there, and the story became Wednesday’s column. 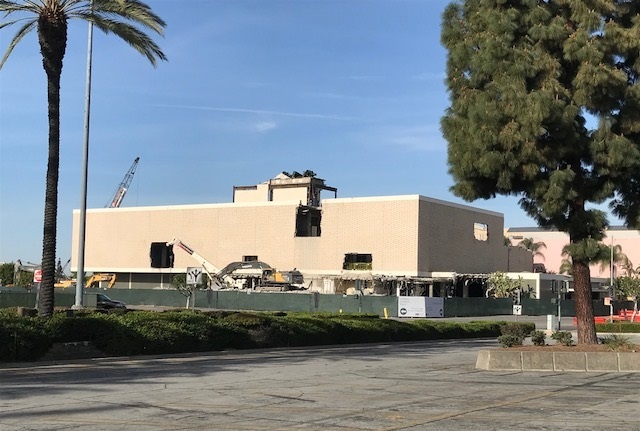 On Monday I compiled comments I’d solicited on Facebook about the old Broadway store into several usable paragraphs to have ready after Tuesday morning’s demolition ceremony for Wednesday’s column, due a couple of hours after I got into the office. But the ceremony proved lively enough that I didn’t have room for the previously prepared material. So I set it aside to use in Friday’s column. Very little goes to waste here. I also have some Culture Corner items, an item about some upcoming appearances by yours truly (two of them this weekend) and a Valley Vignette. 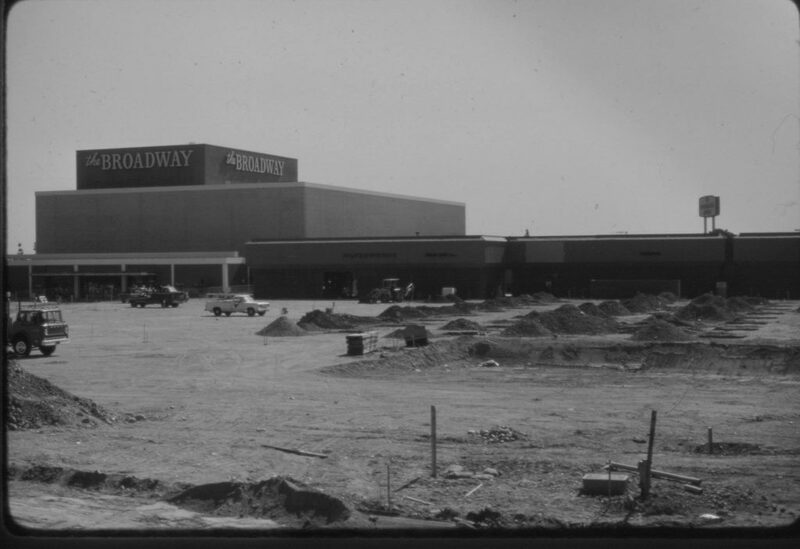 Above, a view of the store under construction from early 1968. 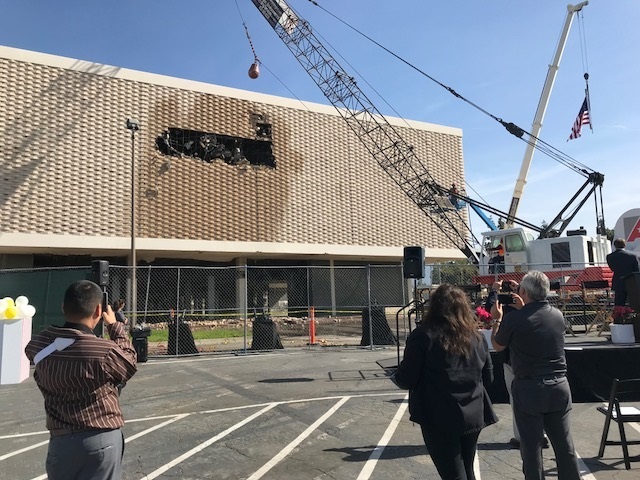 Demolition was already underway, but a public ceremony Tuesday at Montclair Place to mark the end of the old Broadway department store involved a crane with a wrecking ball slamming into the facade. Fun! I was there to witness it and write about it for Wednesday’s column. Above, a view of the store from Central Avenue; below, the south side of the store as the wrecking ball swings. 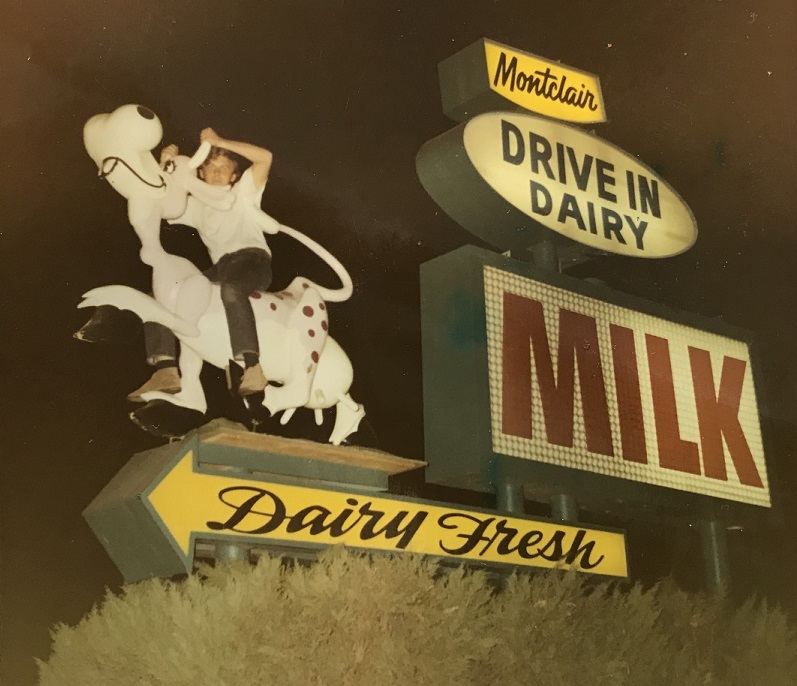 Circa 1968, two 15-year-old pals in Montclair decided to play a little prank involving the Montclair Drive-In Dairy on San Bernardino Road and Central Avenue. They’d long admired the galloping cow figure on the sign. So one night Carl climbed up the pole sign and atop the cow, holding onto the horns like handlebars, while Bill Marino took a photo. Marino, now 64, shared the photo with me recently when we met to talk about Debbie Reynolds’ appearance in 1970 at Montclair Plaza. I snapped a photo of his photo and he told me the story. Carl’s “ride” on the cow didn’t last long. In a short followup to my recent column about Debbie Reynolds’ visit to Montclair Plaza, a cute anecdote turned up that begged to be shared. Also: the author of the California wine history book “Tangled Vines” is headed to Claremont, plus more cultural news of note and a Valley Vignette, all in Wednesday’s column. It’s had a quiet rollout, but a new city law in Montclair is bound to start getting attention. Pedestrians can no longer legally use their phone or cover both ears while crossing the street. Montclair may be the first such city in the continental United States to pass such a law. Check out Sunday’s column for the details.